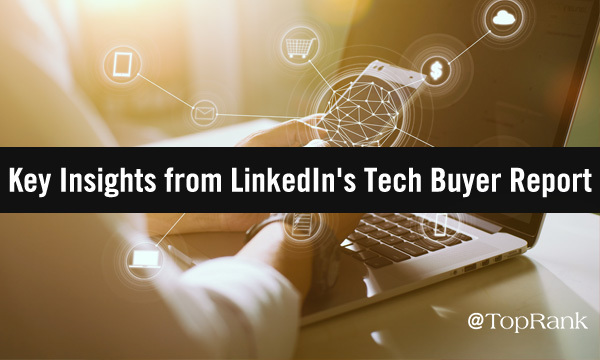 The post Top Takeaways from LinkedIn’s New ‘Enlightened Tech Buyer‘ Report appeared first on Online Marketing Blog – TopRank®. 3 Wochen, 21 Tage, 4062 Kilometer – von Miami bis New York City. 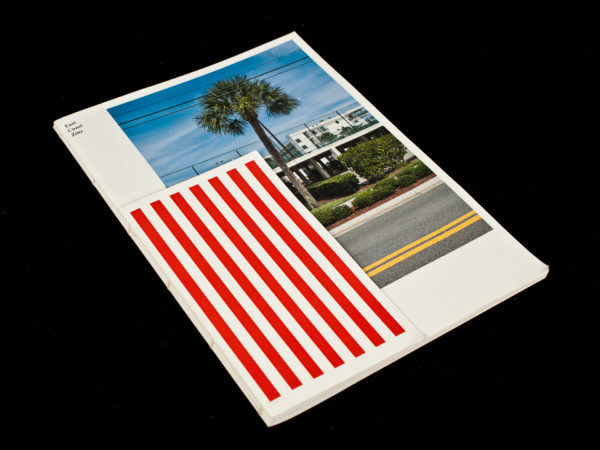 Tagebuchtexte und Fotografien, die während einem dreiwöchigen Roadtrip entlang der Ostküste der USA entstanden sind, vereint in einem kleinen Magazin. Dieser Beitrag wurde unter Design abgelegt am 22. April 2019 von Andreas. Im August 1989 flüchteten meine Eltern in einer gewittrigen Sommernacht vom Osten in den Westen eines gespaltenen Landes. Niemand ahnte, dass es nur ein Abschied auf Zeit sein würde. 83 Tage später fiel die Berliner Mauer und mit ihr eine Grenze, die über vier Jahrzehnte bestand und ein Land teilte. Fast 30 Jahre später, im Mai 2018, begeben sich meine Mutter und ich gemeinsam auf die Suche nach den Orten ihrer Vergangenheit. Dabei beschreibt sie ihre persönlichen Erinnerungen, Gedanken und Gefühle in einem Tagebuch. Ich dokumentiere unsere Reise fotografisch. 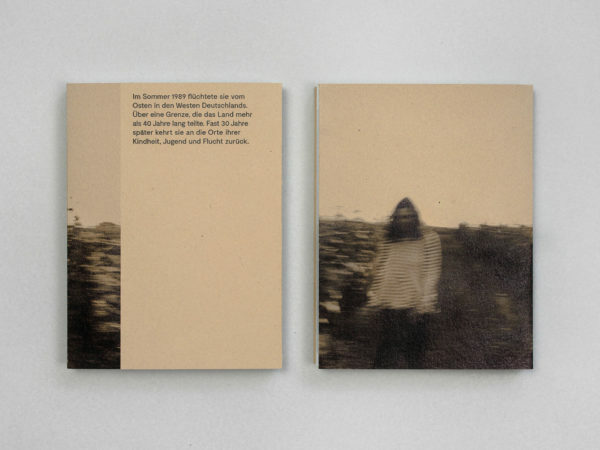 Aus der entstandenen Fotoserie, einzelnen Textausschnitten des Reisetagebuchs und persönlichen Zeitzeugnissen aus der Zeit vor und nach der Flucht, entsteht das Buch „Rübermachen“. Dieser Beitrag wurde unter SEO abgelegt am 22. April 2019 von Andreas. While Instagram influencer marketing is expected to hit $8 billion in spend by 2020, the growth trajectory of influencer marketing is not limited to consumer brands. B2B companies are also realizing the value of collaborating with influential experts for marketing purposes and count the practice as one of the top 4 tactics planned for 2019, according to a study by Spiceworks of B2B tech marketers in North America and Europe. Many B2B brands are considering engaging influencers for marketing but are not clear on exactly how or what the best practices are. Having worked with B2B brands that range from Dell to SAP to LinkedIn on influencer marketing programs over the past 6 years, I’ve had a chance to dig deep into exactly what makes influencer marketing work for B2B. To help illustrate how business brands we work with are driving results with influencer marketing, I’ve pulled together ten examples of B2B companies that represent a mix of approaches and performance outcomes. Situation: Prophix is a corporate performance management software solutions company serving the finance industry. They believed that finance leaders have the opportunity to shape the future of business and take a more prominent seat at the leadership table. Artificial Intelligence (AI) and Machine Learning will be critical to the innovation of finance, so Prophix wanted to start conversations and answer key questions on the role of AI in the next evolution of finance amongst its target audience. Solution: To build thought leadership for the brand around AI and ML innovations in finance amongst its audience, experts collaborated to co-create an industry resource. To add a tech-savvy flavor to the content experience of this resource, a simulated AI personality voice named Penny was created to help users navigate a microsite featuring industry experts. 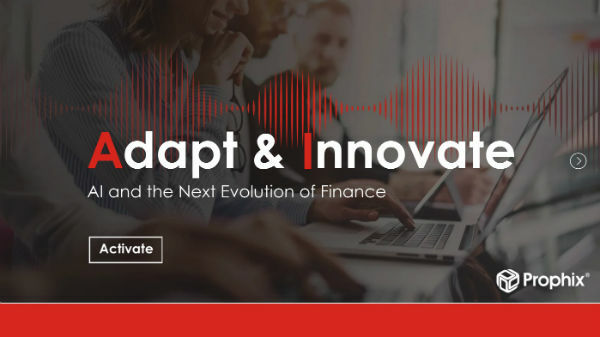 The site was titled, Adapt & Innovate: AI and the Next Evolution of Finance. The microsite was complemented with a mix of content including promotional motion graphics video, email promotions, landing page, supporting blog content, social content and custom graphics for the contributing influencers to share. Results: 642% increase in engagement, new relationships with top influencers and numerous conversations amongst the target audience about AI and finance in connection with the Prophix brand. Situation: As an award-winning content planning and marketing software company, DivvyHQ wanted to elevate its reputation and more actively engage potential buyers. Solution: A survey was conducted to surface top challenges and insights around content planning and marketing, sparking a multi-campaign program focused on future-proofing content marketing that included over 30 marketing influencers. Each of the 5 campaigns focused on content and influencers specific to the topic ranging from the research report to a strategy ebook to a series of video interviews about content planning. The final campaign repurposed the “best of content” from the first 4 campaigns into an interactive microsite using a Back to the Future theme. Each campaign was supported by blog posts, organic social content, influencer promotion and some paid social. Results: Each campaign exceeded goals including 300% more downloads of the research report, hitting some KPI goals within a week of publishing, thousands of video views, new relationships with top marketing industry influencers and 140% of one conversion KPI within a week of publishing. Situation: The legal industry has been slow to adopt Customer Relationship Management (CRM) systems, something that Introhive, an automation solutions provider wanted to change. Solution: With the goals of raising awareness and leads from the legal community, Introhive wanted to engage the audience they were marketing to through an industry survey and insights. 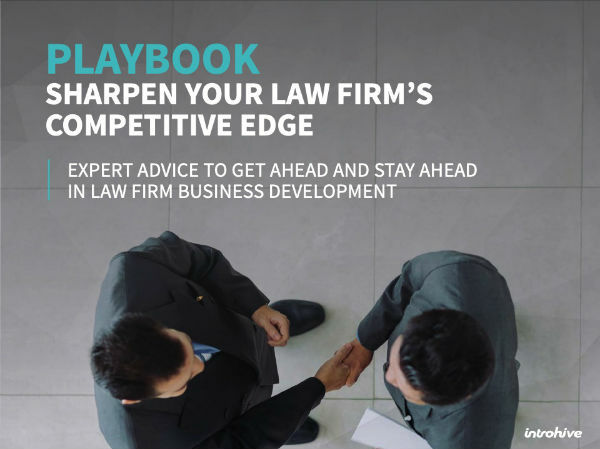 The survey identified the top challenges and Introhive designed a Playbook to solve those problems with a combination of brand insight and expertise from speakers at the industry’s Legal Marketing Association event. During the conference, the contributors shared the playbook and Introhive promoted it using the event hashtag. Additional pieces of the content mix included 12 blog posts, landing page, organic and influencer social shares, paid social and email promotions. Results: Improved marketing qualified lead quality, more playbook downloads in the first month than in the entire lifetime of previous reports, nearly 50% of all brand blog content views for the quarter and an 85% increase in new Twitter followers. 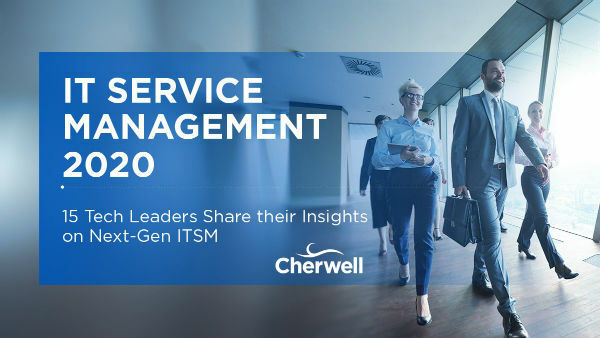 Situation: With ambitious objectives to continue its rapid growth, Cherwell Software wanted to increase brand awareness as a leading ITSM software provider and develop a network of IT influencers. Solution: Using insights gained from research of target accounts, 15 influencers were researched, identified and engaged to co-create content and promotions around next-generation IT Service Management. The content mix included blog posts, IT Service Management 2020 ebook, landing page and both paid/organic social content for influencers to share. Results: The ebook was viewed 170% more often than previous assets and shared nearly 2,000 times. Additionally, this one campaign was accountable for 22% of all sales leads for the entire year. Situation: Wellness programs are common but SAP SuccessFactors wanted to accentuate the importance of employee wellness from a more holistic approach to wellbeing. Solution: To raise awareness of their health care management suite, SAP SuccessFactors developed a program to share relevant, useful and actionable insights about wellbeing from trusted experts, peers and even one business celebrity. Just as the best wellness solutions are holistic, so was this approach to partnering with influencers including industry influencers, internal experts, SAP partners and clients. The content mix included an ebook titled The True Impact of Health and Well-Being featuring 10 influencers, motion graphics, landing page, social content for the brand and influencers to share. Results: 272% increase over the goal and a 68% conversion rate on the ebook downloads. Influencer shares represented 86% of all ebook views and 69% of the conversions. Situation: While many companies focus on working with influencers, Dell Technologies wanted to partner with industry influencers to simultaneously create useful content for their customers and increase the influence of their internal experts. 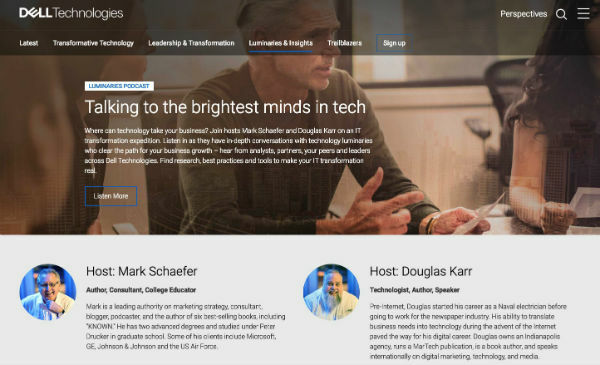 Solution: Dell has developed relationships with a network of influencers including Mark Schaefer and Doug Karr, who host the Dell Luminaries podcast. Their discussions with technology visionaries from inside Dell and out, putting a human face on technology innovation. Results: The Dell Luminaries project effectively created a single platform to bring voices from multiple companies under the Dell brand together following a common thread while staying true to their individual expertise and influence. Situation: Science can seem out of reach to many and 3M wanted to make the innovations and complexities of science accessible to the everyday person. Solution: 3M conducted the largest ever science study about global attitudes about science, the State of Science Index research report along with the launch of 3M’s first podcast: Science Champions Podcast. Hosted by 3M’s Chief Science Advocate, Jayshree Seth, the first season of the podcast featured twenty one science experts and influencers on topics ranging from an introduction to science in everyday life to careers in science. Results: Outside of creating relationships with science influencers and showcasing an internal influencer, the Science Champions podcast exceeded all expectations for downloads and engagement, resulting in the launch of season two in March 2019. Situation: There are many choices for marketers to attend industry events and Content Marketing Institute wanted to create broader awareness of its conference and showcase its speakers in a way that tapped their influence and helped them become more influential. Solution: Many months before the conference, a selection of content marketing speakers were identified and engaged to share their expertise on specific content marketing topics. With a conference theme of “Game on“, the 36 influential marketing speakers‘ contributions were assembled into a 48 page ebook called The Ultimate Guide to Conquering Content Marketing with a retro video game theme. Each section of the ebook was supported by corresponding animation videos using an 8-bit video game theme featuring game character avatars for each influencer. The content mix also included 6 long-form interviews, multiple promotional blog posts, email marketing, custom social graphics for the brand and influencers to share, organic and paid social promotion. Results: A 258% increase in views of the main ebook asset and over 30,000 views of the promotional 8-bit video game interviews. Situation: SAP launched its Leonardo platform at the annual SAPPHIRE conference. With an event this large, key announcements can blur in the noise of communications. SAP wanted to launch Leonardo as a transformative technology vision. 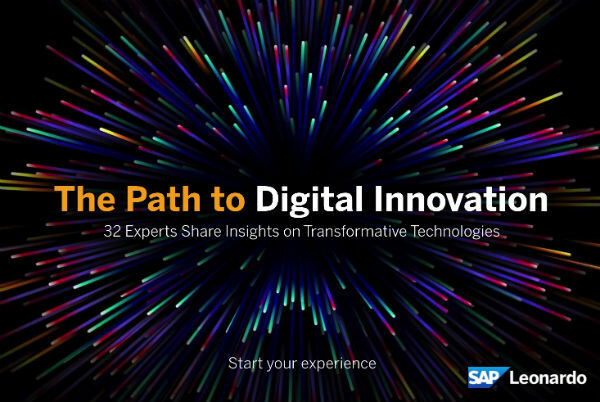 Solution: An interactive experience called The Path to Digital Innovation was created showcasing SAP CEO Bill McDermott and 32 top industry influencers sharing insights across transformative technologies including IoT, machine learning, AI, blockchain, analytics, big data and cloud. Results: 100% of participating influencers shared the Leonardo Path to Digital Innovation content, many of them multiple times. Reach was unprecedented, with over 21 million views of the interactive experience. Situation: Known for world-class managed DNS services, Oracle Dyn wanted to create awareness and authority for their web application security solutions focused on bot management and mitigation services. They also wanted to develop relationships with relevant industry influencers. Solution: To create awareness and credibility for this new cybersecurity capability, internal subject matter experts and relevant industry influencers including Eric Vanderburg and Kevin L. Jackson with authority in the cybersecurity space were engaged to collaborate on The Cybersecurity Intelligence Report: Bot Management and Mitigation. Results: 100% of the influencers engaged shared the report and all program goals were exceeded within 60 days of the launch. 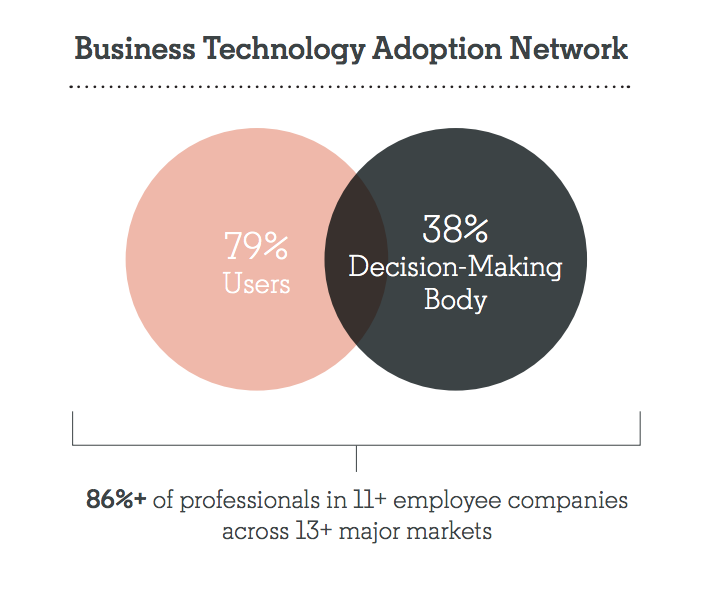 Where Does B2B Influencer Marketing Go From Here? In the research report, Influence 2.0: The Future of Influencer Marketing by Altimeter Group’s Brian Solis, 48% of B2C companies are running ongoing influencer marketing programs vs. only 11% of B2B brands. Nearly half of B2B brands are still in the experimentation stage, according to the study, which was conducted by Traackr and TopRank Marketing. But this trend is changing and more B2B brands are realizing that while different than B2C, working with influencers in a business to business context represents a significant opportunity to create more credible content that can be promoted to interested buyers by people they trust. Many of the examples in this article started with customer research and added outside expert commentary in a way that was relevant to both the brand and the audience. This shift in focus from the brand talking about itself towards a more collaborative approach involving external and internal influencers represents a key change successful B2B marketers have realized. Trends come and go, but the value of trusted sources of information to customers looking for solutions couldn’t be any more timeless. 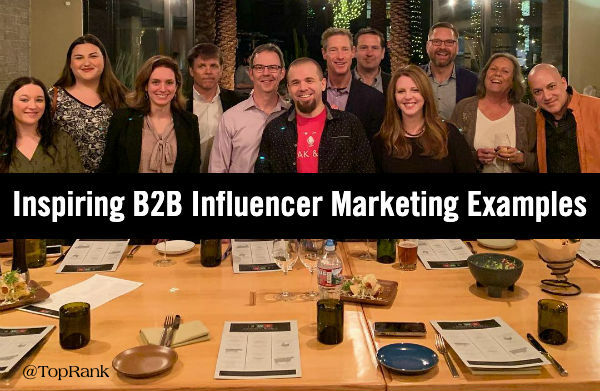 For more information about how TopRank Marketing works with B2B brands to improve industry awareness, increase influence and community engagement, drive leads and sales by partnering with industry experts, check out the influencer marketing section of our website. A version of this post originally published on the Digital Marketing Institute website. The post 10 Inspiring Examples of B2B Influencer Marketing in Action appeared first on Online Marketing Blog – TopRank®.